The ABI is an easy to perform non-invasive test which compares the highest systolic brachial pressure to the highest ankle pressure by dividing the ankle pressure by the brachial pressure. The resulting number is the Ankle Brachial Index. A number below .99 shows the presence of decreased arterial blood flow due to PAD with the disease severity increasing as the number gets lower. Occasionally a diabetic patient will have very stiff vessels that are non-compressible due to calcification and they will have an ABI of over 1.3. These patients should have a TBI (Toe Brachial Index) performed since the toes do not have the same calcification problem as leg vessels. Patient preparation: the patient should be asked to refrain from smoking for at least 2 hours prior to testing to decrease the chance of peripheral vascular constriction. Patient should be supine with the limbs at the same level as the heart in a comfortable position in a warm room. They should remove sox and shoes and any long sleeves. If they are cold, a blanket should be provided. 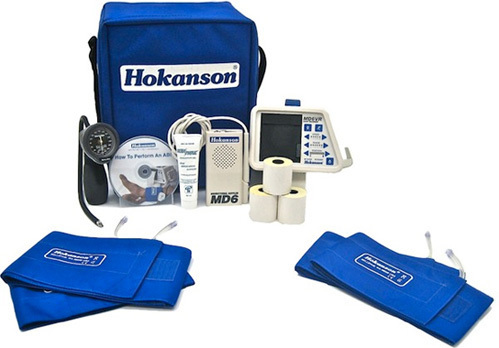 Equipment needed: You have everything you need in the Portable ABI Kit which includes: a 5 MHz bidirectional Doppler, chart recorder, aneroid sphygmomanometer (cuff inflator), 2 SC12 and 2 SC10 straight segmental cuffs, chart paper and coupling gel. You will also need paper and pencil/pen and a calculator for documenting the pressures and index. Select the appropriate sized cuff for each limb. You will need one cuff for each upper arm and for each ankle. Measure the cuff width to the diameter of the limb; the cuff width should be 20% larger than the limb diameter to compress all of the soft tissue evenly. The cuff should be put on straight and fit snuggly but not tight. You must use vascular cuffs which have long bladders to completely encircle the limb and compress all of the soft tissue. Put the cuffs on the arms and ankles once the patient is supine. Have the sphygmomanometer, patient chart, etc. in the room ready to use. A patient can relax best if undisturbed. The rest period should be at least 10 minutes with 15-20 ideal. The goal is for the patient to relax. This time can be used for interviewing the patient, listening to the heart, palpating the abdomen, checking the neurological reflexes and sensation in the feet. Taking ankle pressures: It is very important that the patient’s feet are warm to the touch so that the circulation is adequate for the test. To take the posterior tibial pulse, find the pulse by locating the medial malleolus, the posterior tibial pulse is 2-3 cm below and behind it. This pulse is deeper than the dorsalis pedis so it requires a bit more care and concentration to palpate. Once you have palpated the pulse, put gel on the spot and using the Doppler (angled towards the patient’s head about 60°) obtain the Doppler signal and waveform. Again find the spot and angle with the loudest sound and best waveform, then inflate the cuff until the sound and waveform disappear and then inflate from 20-30 mmHg above that number (super systolic). Slowly deflate the cuff (around 2-3 mmHg at a time) until the sound reappears (Korotkoff sound) the waveform will follow immediately after the sound. The pressure reading when the first sound appears is the correct systolic pressure. Deflate the cuff completely and record the systolic pressure for that site. Be sure to run strips at each site because the waveform also shows evidence of health or disease. Next perform the Dorsalis pedis pulse exam. To find the pulse, place fingers on the area between the line of the first and second toe half way down the dorsum of the foot. You are over the navicular and intermediate cuneiform bones; the pulse can be felt where the artery passes over this area of the foot. Put gel on the pulse and obtain the best Doppler signal (sound) and waveform, then inflate the cuff until the sound and waveform disappear and then inflate from 20-30 mmHg above that number (supersystolic). Slowly deflate the cuff (around 2-3 mmHg at a time) until the sound reappears (Korotkoff sound) the waveform will follow immediately after the sound. The pressure reading when the first sound appears is the correct systolic pressure. Deflate the cuff completely and record the systolic pressure. Repeat these exams on the other side of the patient. To calculate the ABI: Divide the highest ankle systolic pressure with the highest brachial pressure for the index. Although there are other organizations that slice and dice the 0.91 and below levels into other categories, they agree that above 1.3 the arteries are too calcified to be compressible and should have a TBI or Toe Brachial Index performed. Also below 1.00 is abnormal. The waveforms should be examined especially the ankle waveforms. Normal, young, healthy adults have a triphasic waveform, with a sharp upstroke (pointed top) and the downstroke dips below the baseline and then returns to above the baseline. A biphasic waveform is also considered healthy but mildly abnormal. As the waveform flattens out and becomes more monophasic and flatter this shows more and more progressive disease. Healthy vessels have more elasticity which creates the triphasic waveform as a response to the pulsation of the blood through the vessel. Important note not all people with PAD are symptomatic.